This is one of my favourite pictures of my oldest Lucas, who will be 6 on Christmas eve. 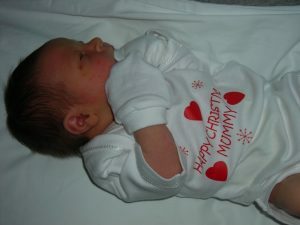 Lucas wasn’t due until the 31st December and with him being my first I thought I’d go over due. This wasn’t meant to be. I developed pre-eclampsia and had to be induced early. After a traumatic birth with him having no heartbeat, my blood-pressure through the roof, Lucas was delivered on Christmas eve. This is him less than 24 hours old, wearing the first outfit I ever put on a baby, the first nappy change, first bath and first little mittens. He was only 6 1/2 lbs so tiny compared to my other Tyler. My little Christmas miracle. And what a blessing he is. This is the first moment I looked down in awe and realised I was a mummy to such an amazing boy. A boy who brings me joy everyday and I love with all my heart.